The photograph above hangs as one of a pair either side of a charming 18th century mirror in Stanhope Dressing room on the first floor of the Castle. The other photo is in a similar theme. Most houses like Highclere have archives, often housed in specially designed rooms and dating back centuries. They are a unique window back into the past and at Highclere, the archivist and I try to share them with visitors, framing them for corridors as they come round, or use them to help people with their research into their family history as it might relate to Highclere. Photographs are particularly captivating providing as they do, quite literally, a snapshot of a past lifestyle and social class. Copies of a few of one particular time in Highclere’s history in the early 20th have been in the press recently proving their interest. What really brings them to life however, is the back stories behind the grainy prints. Who were these people and what were their stories? Last week we had a lovely day sharing and celebrating the photos and stories of a “Highclere” family. Colonel Charles Clout was badly injured in the trenches in the First World War and sent back to England. He was adamant that he did not want to go to Lady Carnarvon’s hospital. Instead, he wanted to be near his sisters. He was ignored and sent nevertheless. He was in fact nursed back to health by Almina, the 5th Countess and had two operations at her hospital. 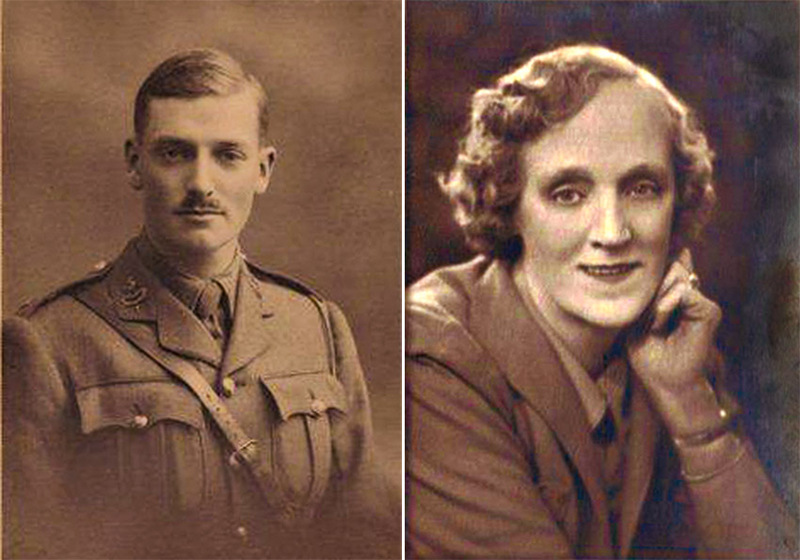 The story is more than that because he fell in love with, and later married, Almina’s secretary, Mary Weekes, who was “helping to run the hospital extremely competently” according to Colonel Clout. Later, Almina organised their wedding at St George’s Church, Hannover Square, London in July 1918. She gave them many presents, providing for their honeymoon and always remained there to help them, as they started their life together and soon their family. I only discovered the story a few years ago, quite by chance. A descendent, Izzy (Ismena) Clout, leant out to stop me as I crossed the Saloon on a day we were open to the public. Lunches and teas followed. We had some letters and photos, they had others. 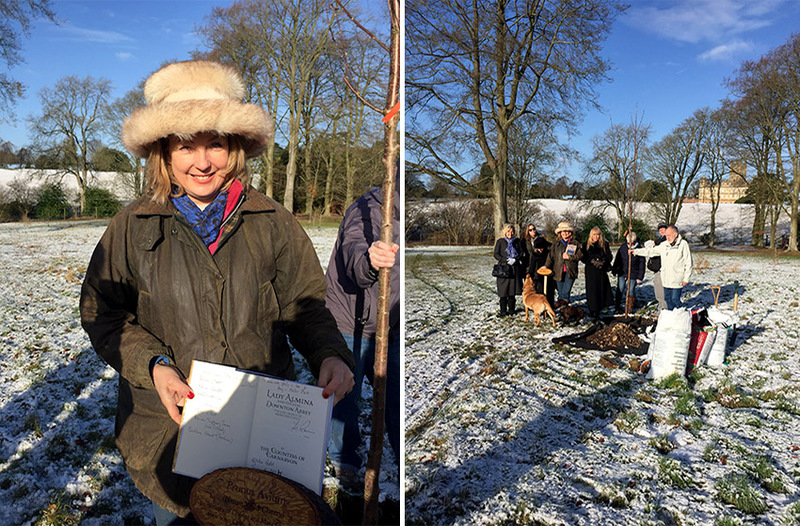 Their story was part of the book “Lady Almina” and some of the Clout family were able to return last week to plant a tree in their grandparents’ memory. We had a fun day together, walking with my dogs across snowy lawns, down to the Wood of Goodwill, to where Paul and the garden team had dug a large hole for the tree. Hearing the stories, as we walked warmly wrapped against a bitter wind, I felt very lucky to have met them: the photos of Mary and Charles came alive. We returned to find David and some archive photos and letters addressed by Mary or Charles to “My Dear Fairy Godmother” (Almina). I am so glad I turned on that day and said hello to Izzy, a remarkable girl who battled cancer but has since sadly died. I so love your blog about tree planting and looking back into the past. I to treasure my past ancestors and often find myself wondering about how their lives were. Reminds me that my family and I need to start or finish recording OUR history, if it’s not too late already…my mom is 89, all our memories are fading. She is the last of our parents and with her go all the names on the pictures that she has…..!!!! Children aren’t as inquisitive nowadays…… WE don’t gather in the numbers, as WE did as children, to hear the gossip and history of our relatives. Sad excuse. Someday THEY will thank US. Your rewards for all your historical research are the visits and appreciative relatives, who return to “plant a tree”. Tree planting is wonderful ! What a fascinating thread of a story of the Clout and Carnarvan families! It’s amazing how a few seconds to say hello can lead to two descendants discovering a shared event all those years ago. So fortunate it happened before the sad death of the grand-daughter. Having photos to add to the stories is a wonderful addition. Yes, they are a pain to catalogue and arrange, but as the saying goes, a photo is worth a thousand words. 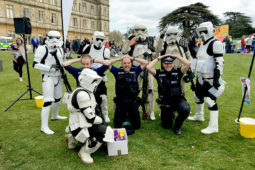 Hang in there Lady C. You are doing a great service to the history of Highclere and British history. One of my most favorite things to do in this world is to organize. So wish I lived in England so I could spend all my volunteer time helping you to catalog. I work in a local library here in the states and am amazed at their well rounded and proven catalog system. If you ever hold a program allowing people to help with cataloging and arranging please count me in. This could be a program like an “archaeological dig”. I would gladly pay to help with these efforts. 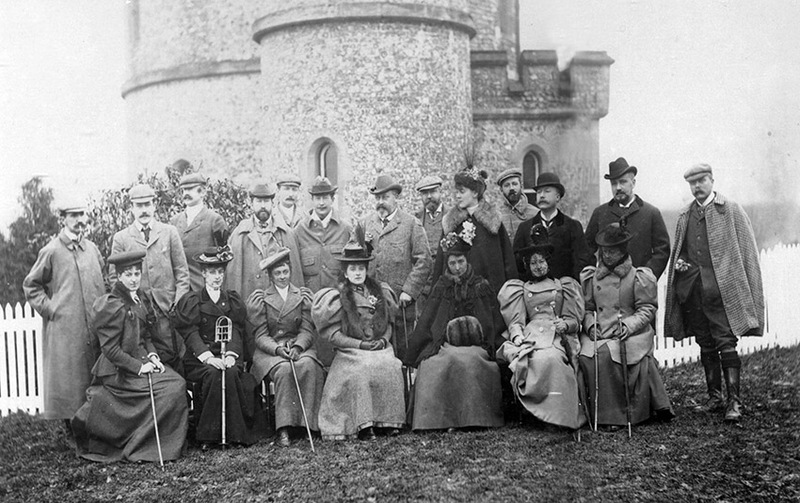 Isn’t that Prince Albert (or was he King Edward VII at the time) in the photo at the top — the gentleman standing in the center behind the ladies? I’ve read that he had many friends among the British aristocracy, and this photo appears to be a gathering — perhaps a shooting or house party — that he may have attended. Backstories are fascinating. I’m sure every one of the people in that photo has an interesting story to tell. Thank you for sharing. It is the Prince of Wales and his private detective/policeman is on the left hand end with a cigarette. Some of the descendants of the guests remain friends today and have filled in the identities.. I notice that the headline photograph depicting the King is taken outside of Grotto Lodge, the home of my grandparents George and Daisy Baker from the 1930s to 1960s. George was a Gamekeeper on the Estate and my father Jesse was a Gardener. Others from the family also worked on the estate or Highclere Castle. I have many happy memories of The Grotto. How amazing – I heard some stories about your grandparents from another man who came back to visit – he is now 85 and was very spry – climbing ahead of us up a hill to where he saw a plane go down in WW2. Do you have any stories or photos? i am just beginning to do up the Grotto as it has the best views in the world and I thought i could do some summer lets. It is one of my projects for this year. If you have any photos of your grandparents,would it be possible to have copies? We could frame some of the history for the walls. What do you think? What a wonderful story, and it would be fascinating to learn from others of their stories and connections to Highclere Castle. You are doing a great job making a digital archive of all the history and stories. May they inspire more of your fine writing, and may we see many more books, like your “Lady Almina” and “Lady Catherine”. What a joy to read, and reread! It is the hours in the day!!! 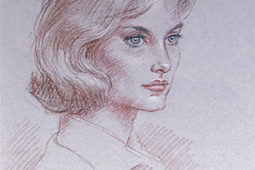 I have just read some entrancing references to Charles Barry, the architect, and think I should do the prequel to Almina. But I have a new book coming out – a coffee table book, first ever about Highclere, with stories, menus and recipes. There are also 6 portraits in photos and words of people – our family ,really – who “travel with us” each day and have worked at Highclere for years – over 60 years. I found writing their stories very moving – it is their voices. Another lovely story and happenstance! We very much enjoyed our visit and look forward to coming again. Thank you for the link. Look forward to seeing you but you must tell when! Thank you your ladyship for sharing the wonderful history of Highclere! Another fascinating story of connections that reach to the present. Best of luck in your research and digitalizing (?) efforts! We have scanned thousands of family photographs and documents in an effort to preserve them for our future family members. The younger members are impatient with boxes of “stuff” , so we hope they will appreciate the scans! I always look forward to your writings. Thank you! Like always I enjoy all of your blogs . Especially this one,as I am a big history buff.Especially the family history.I recently found out that I am a distant relative of Cornelious Melyn.He was born during the 18th century and had been the first person to have property in Manhattan, NY. By all means please keep us informed about the Highclere castle, as I always enjoy reading your blogs about the fascinating castle. Thank you – all those brave pioneers too creating new towns! I so miss watching Downton Abbey on PBS – but – your blog keeps Highclere and life there more alive and fascinating with each new addition. 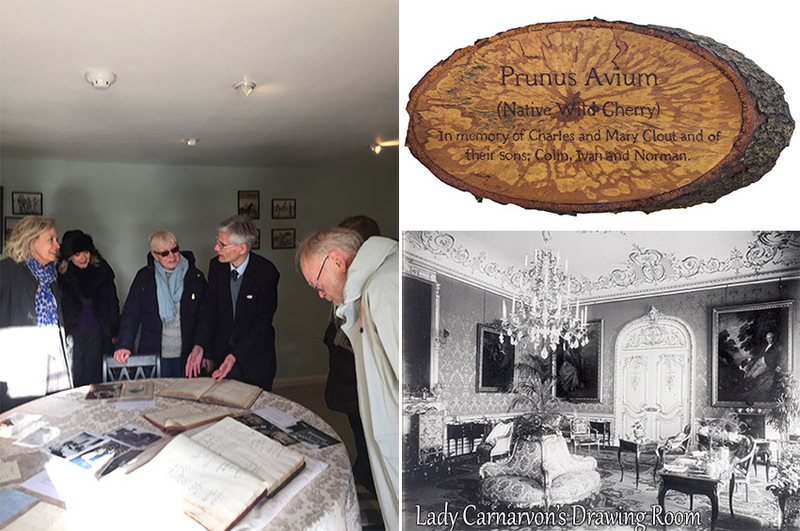 This is such an amazing story – reminds me of Carson and Mrs. It’s wonderful to see the warmth of the Carnarvon clan had and has toward others of lesser estate and to know the wonderful contributions they made to serving mother England. You are a wonderful addition and asset to them and us in your court of readers – and friends. There are no coincidences with God and you never know what good comes the trials we face in life. Thank you for allowing the Clout family to honor their elders in such a beautiful and lasting way. We definitely had our own Carsons and Mrs Hughes and like in Downton they ran a fair but firm household. can anyone confirm (or not) if that is prince albert in the photo? I loved the story. I attended the Garden Party on September 10th. Lady Carnarvon greeted me at the door. Later, as she was walking through her home, I asked about the hidden Egyptian artifacts that were found between doorways. She walked me to the doorway and talked about the items found there. They are now encased in glass. She and the Earl also spoke to us at various times that day. I had my picture taken with each of them–the Countess in the gift shop and the Earl in front of his grandfathers restored Mercedes. Being an American it wasn’t conceivable to me that they would be down-to-earth people. That is why people will return over and over again. I hope to return on my next visit to England. Countess, when will your book be published? I’ve read the others and don’t want to miss your new one. Thank you – This next one comes out here in March and North America in September. We are just sorting out the Amazon pre register links to each site. I so enjoyed this blog entry. The story of the couple getting married and witnessed by Lady Almina was charming. I imagine Lady Almina and Lord Carnarvon were privy to many such events in the community. 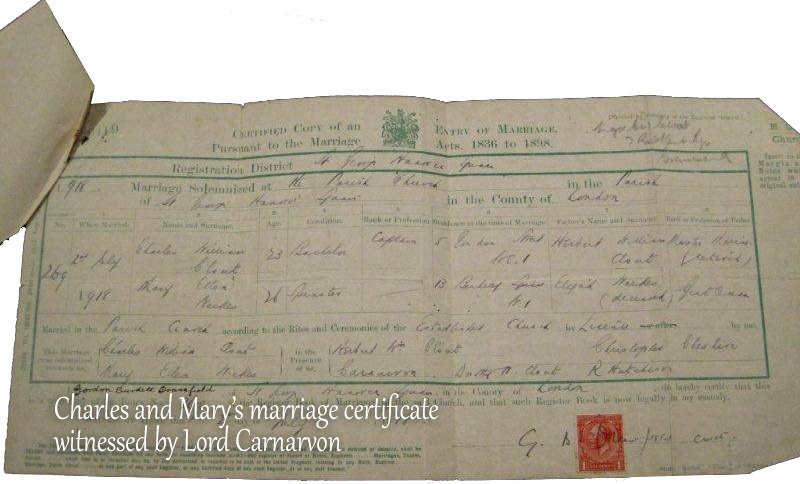 It’s lovely to see that you take an interest in the family history, Lady Carnarvon. Your digital archive seems to be a great success so far. 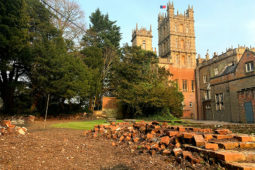 Think of the future generations who will delight in the history of Highclere Castle. It is a cheering thought to me. Thank you Lady Carnarvon for keeping this history and sharing a couple of stories with your readers. They were a dedicated couple supporting local communities and taking the time to talk or help people. DEAR LADY CARNAVON TREE PLANTING IS WONDERFUL.NICE STORY. It is a lovely story..
Are you planning to create the archive which will be available online ? I am especially interested in photographs and documents related to the Egyptian antiquities which are exhibited in the castle. I would like to put more on line and in the next 2 or 3 years return to the Egyptian stories. It is called hours in the day. Estimada Lady Carnarvon. Visitare Inglaterra para mi cumpleaños. Exclusivamente deseo conocer el Castillo. Y no logro conseguir dos tickets para el 28 o 29 de mayo. Hace mucho estoy ahorrando para ir. Y ya tengo los pasajes para viajar. Como puedo hacer para conseguir los tickets? Es mi sueño, y no creo poder volver a Inglaterra. Mis nietas (tengo 2) estan tan emocionadas de mi viaje, que siempre me dicen que voy a ir al Castillo de Dowton Abbey. Le estare eternamente agradecida. I bought your books(I’m not good with English) but I read them, it took a lot of time, but I fell in love with Almina and Catherine. in April I will be in those parts but the castle is closed. I was hoping to meet you to get the autographed books. Just email the office – we are open for so much of April! We can at least check the dates..